If you've got access to the live stream, the Strypes are playing right now to an overflowing tent and going down a storm. Was kind of hoping it would be out in to the audience. Mick Taylor is gonna be there. The Strypes on BBC 2 now. Elvis Costello is doing out of time on the BBc web. It ought to be something with a big loud riff as the intro - JJF, Satisfaction, Start Me Up - then they can carry on into the usual GOOMC if they want to. Big loud riff did you say ??? 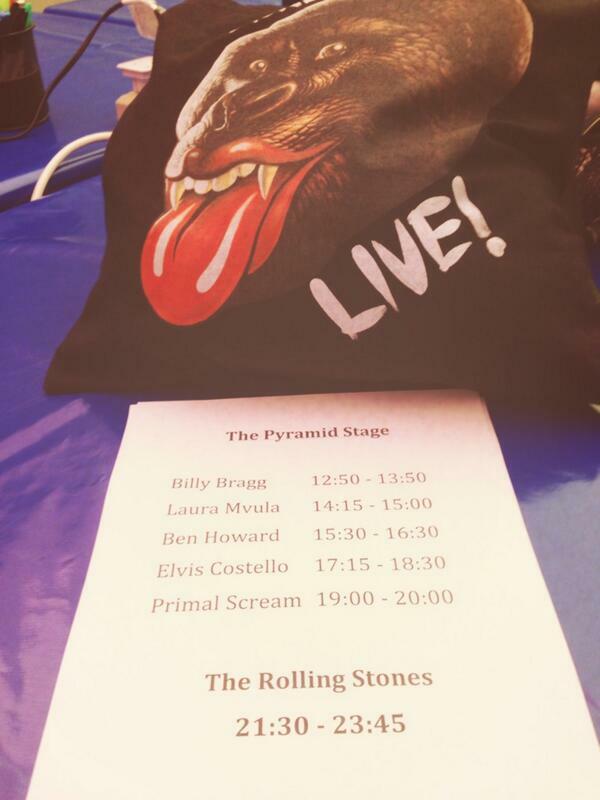 Well there's no point in the Rolling Stones playing then really, is there ? all that quiet stuff they do. Do you mean to say they're known for big loud opening riffs ? They are ? I think Primal Scream is doing more than fine with their show. They just finished their set. Next up is the Rolling Stones! Right now: only video, no sound. Same for you? So, 23.30 CET on BBC2, right? Now that's what I call a scarf. To all those lucky ones out there at Glastonbury: Have fun and enjoy every minute! Yes, no sound. 35 minutes to go! The link wants me to download iVivid and codec? Are they safe? Now that Wimbledon finished for the day, got another 3 channels to watch Glastonbury on over here in Spain. Watching Hain the girl band who just seen played RocksOff with Primal Scream. The anticipation is building up in this little area in Spain. Don't bother. They won't be streaming the show. Just wait 'til 10.30 (BBC2). Edited 1 time(s). Last edit at 2013-06-29 23:12 by BowieStone. Anyone see the Set List Yet ? send your emailadress to get a Premiumaccount with 10GB.